When labour unions had asked for a new tri-party board, the government had replied that it has an idea of 'single board' for all the unorganised workers in state. Mumbai: Anusuya Aaifale is now 55 years old, and has been waiting to get her rightful aid under Sanman Dhan Yojana – a welfare scheme for domestic workers. Earlier, the state government used to give Rs 10,000 to each domestic worker after the age 55. When Anusuya reached Azad Maidan for the meeting of domestic workers across Mumbai, she realised that she is not alone. Same was the story of Meera Ugale (56) and Anusuya Kumkar (57). Nobody has received a penny from the government in the last four years. "This is just because of the Bharatiya Janata Party-led government's anti-labour policies in the state. 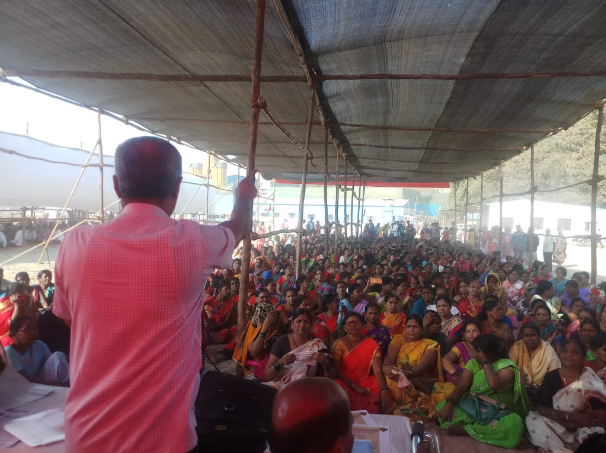 The tri-party board under the Maharashtra State Domestic Workers’ Welfare Act 2010 has not been constituted for last four years. These workers are cheated by this government," said Uday Bhat, member of the erstwhile board and labour unionist. After a long battle for almost two decades, domestic workers were brought under Act – even though it is deemed weak – in 2010. Under this Act, it was mandatory for the state government to form a 'Tri Party Board'. The three parties would comprise representatives of domestic aid, government representatives [in this case, labour secretary and commissioner], and third was representatives of the employers. This board came into existence for the first time in 2011 for a period of three years. So, on August 13, 2014, the board's term was over. The then Congress-led government had given three-month extension to the board. On October 31, 2014, the new BJP government led by Chief Minister Devendra Fadnavis came to power. It neither extended the term of the board, nor constituted a new one. "Since then, there has been no board, and domestic workers are left to their fate," said Bhat. A single-member board pertaining to the Act seems to be in place in the state. However, it is nothing but dysfunctional. When labour unions had asked for a new tri-party board, the government had replied that it has an idea of 'single board' for all the unorganised workers in the state. One of the sources in Labour Department of Maharashtra said, "This idea was never pushed seriously in the department. There was zero enthusiasm to form a new board from the beginning." The 2010 Act passed by the legislative houses promised a number of schemes and benefits to the workers. Almost four lakh domestic aides from all over the state have been registered under this act. As per the provisions of this Act, the government was bound to make a one-time payment of Rs 10,000 as 'Sanman Dhan' (Honorary Payment) to the domestic workers of age 55-60 years. As per the records of the board, 30,000 domestic workers received Rs 10,000 each in the year 2013-14. However, after 2014, not a single domestic worker has received any aid. Additionally, the domestic workers were covered under LIC’s Janashree insurance scheme, which was monitored by the board. The yearly premium was only Rs 200, out of which, Rs 100 were paid by the Centre, Rs 50 by the state and Rs 50 by the worker. This scheme covered a number of situations including accident, sudden death; and would pay a scholarship of Rs 100 per month to up to two children of the workers, studying in standard VIII and XII. The domestic workers do not have this cover anymore. The board would also give Rs 10,000 for delivery of a child, and Rs 5,000 as funeral expenses to the workers. But as the board is not inexistent since 2014, this financial assistance has stopped completely. In the interim budget presented by interim Union Finance Minister Piyush Goyal on February 1, the Centre announced a new scheme for the domestic workers called Pradhanmantri Shrama Yogi Mandhan Yojana (PM-SYM)’. But labour unionists are opposing the provisions under it, calling it 'illogical'. "Government is proposing this scheme for labourers of age less than 40, and they will get benefits in their 60's. Till then, labourers will have to keep paying the premium under the scheme. So, the scheme which does not provide help to labourers during their working days is not useful," said Bhat. Senior social activist and labour unionist Baba Adhav too raised questions on the scheme. "This scheme is being perceived as ‘help’ from the government to the workers. This is wrong. Government is taking money, labourers will have to contribute to the scheme. So, how come it is 'help' if there is a contribution," asked Adhav. In its last year in the office, the BJP government is working to form a new board comprising all the sections of the unorganized workers. "We will form this board before the start of the next session. My department is working on the proposal," said Labour Minister Sambhaji Nilangekar Patil.